Yesterday was such a historic day! We took the kids right into the voting booth with us so they could be a part of it all. I told them that they were going to see history being made: we were either going to see the first African American president, or the first female VP. I was so proud to be able to share it with them. I hope so much that they remember it all. On the Craft site, I found the Color Your Own Electoral College Mapto color as the results came in, and I printed a bunch out thinking I'd do it with the kids... and then realized that they'd all be in bed before the polls closed! So we gave some to Paul's students and parents, and just colored them and had fun. This morning, Paul gave them some more blank maps - and let me tell you, do kids ever love to color in maps! 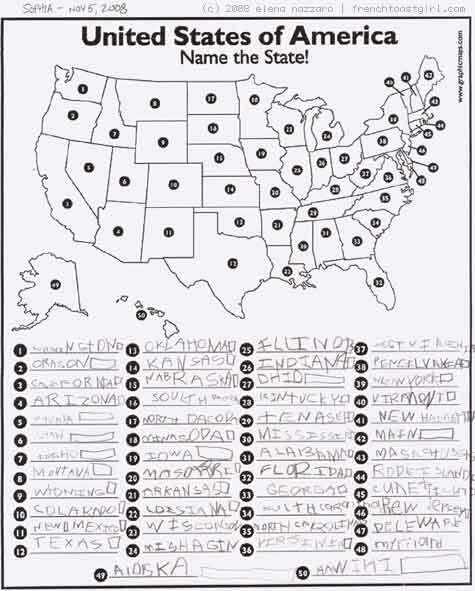 Sophie filled in all the states herself, but what I really enjoy is the creative spelling (which I suspect was entirely on purpose). My personal favorite is "Pencilvania," followed by "Minasoda".